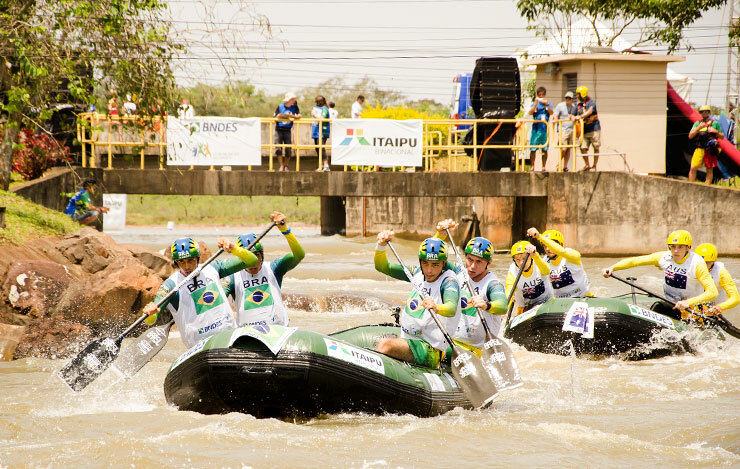 On this first day of competition in the R4 Rafting World Championship 2014 in Foz do Iguaçu, Paraná, there are 13 countries in Youth (Under 19) and Junior (U23), Male and Female, on the Sprint and Head to Head competition, both played at Itaipu Canal, on the dependences of Itaipu Binational. The highlight of the day came from the Brazilians, winners of the Sprint in U-19, male and female, and Under 23 Female. In the Under 23 Male the winners were the Czech Republic. In the Head to Head, Brazil were masters in the men’s category taking first place in the Under 19 and Under 23, as well as gold in the Under 23 Female. In the Under-19 Female the victory went to Australia. The countries participating in Under-19 and Under-23 R4 Rafting World 2014 are: Brazil, Russia, Australia, Slovakia, Indonesia, Japan, Argentina, New Zealand, Czech Republic, Slovenia, Colombia, Austria and the Netherlands. This is the first time that an R4 World Championship has been held in the categories of U19 and U23. “Previously there was only the Junior category, designed for athletes between 16 and 22 years of age.” said the American Joe Willie Jones, president of the International Rafting Federation (IRF). After the Sprint and Head to Head, the Brazilian teams are showing the home advantage and lead in three of the four categories for the title of overall champion in 2014. The Under 19 Men is Brazil in first place with 300 points, followed by Russia with 264 and Australia with 223. In the Under 23 Brazil leads with 288 points, followed by the Czech Republic with 258 and Slovenia with 255 points. In the Under 19 Female the leader is Australia, ahead of Russia and then Brazi. In the Under 23 Females Brazil leads with 300 points, followed by the Czech Republic with 264 and Japan with 237 points.